Adopted at Pet Smart at four months old, Dillon helped us heal after the recent passing of our Beagle Maggie. 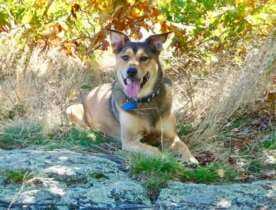 His passion was to be with us.... And to walk, hike, camp and rest in the sun sniffing the wind and smiling. "Dr. Jo is a gifted and grace filled Veterinarian. She brought calm and gentleness to a very difficult goodbye. Her genuine empathy and professionalism created a peaceful passing for our canine son Dillon. We are privileged to have worked with her and will always be thankful for her service." I have had the personal pleasure to know this little guy ever since I entered the Huffman family 12 years ago. I have never met such a well mannered, soft tempered, adventurous and sensitive spirit in a dog before. Whether we were going on long adventurous hikes up to Siler Bald, or sitting around hanging on the couch together, he was always a great companion and friend. I only wish his licking of my fourhead would’ve cured baldness. You will be missed Dill-bone! What an incredible companion we were all blessed with for the past 15 years. He'll be in our hearts forever. Sending you love and light as you navigate life without him. So sorry for your loss! Dillon was a great dog! He was definitely part of the entire extended family! I hope that the pain diminishes and the memories of him will be sweet and everlasting.